Product prices and availability are accurate as of 2019-04-18 14:27:57 UTC and are subject to change. Any price and availability information displayed on http://www.amazon.com/ at the time of purchase will apply to the purchase of this product. The Schwinn MY17 470 Elliptical provides whole body training with less stress on your joints, and in the comfort of your home! There are 29 preset programs to give your workout routine variety and 25 levels of resistance to match your fitness level. Keep track of your progress on the backlit LCD screens; transfer time, distance, and calories tracking via Bluetooth to the Schwinn Connect app or your favorite fitness apps. The large, cushioned footplates create a stable and comfortable place for your feet and the static handlebars are ergonomically placed to match your stride. 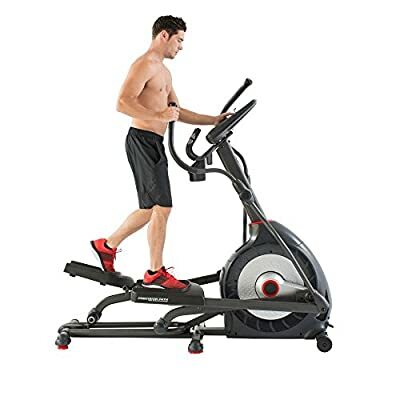 Additional FeaturesMultiple user capability for up to 4 user profiles USB charging port Telemetry heart rate enabled (chest strap not included) 5 incline and 5 resistance quick keys 6 LED tracking lights 3 speed fan Sealed acoustic chamber speakers 20-inch stride Plugs into 110V-120V outlet (power adapter included) 29 preset exercise programs. 25 levels of computer controlled resistance. Bluetooth transfer of time, distance, and calorie goals. Made of steel materials in gray. Weight capacity: 300 lbs.. 10 year frame, 2 year mechanical, 1 year electrical, 90 day labor warranties. Assembled dimensions: 70L x 28W x 71H in.. Assembly required.